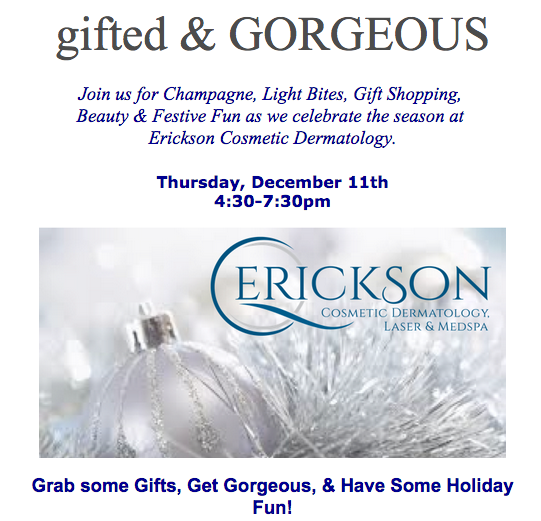 You’re Invited to Erickson Cosmetic Dermatology’s Gifted and Gorgeous Party! We’ll have tons of super fun specials on treatments and products, trunk shows from Jo Malone London and Alexis Bittar, express hydrafacials, Jo Malone Hand and Arm massage, champagne, hors d’oeuvres and much more. Get Gorgeous and Get Gifting: the Ultimate one stop shop!